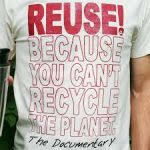 MAHWAH, N.J. – The Krame Center for Contemplative Studies and Mindful Living at Ramapo College will present a screening of the ground-breaking film “Reuse, Because You Can’t Recycle the Planet” followed by a discussion with the producer and director of the film, Alex Eaves, from 1-3 p.m. followed by a tour of his innovative Box Truck Tiny House from 3-4 p.m. Moderated by Professor Ashwani Vasishth. This event is free but registration is required. Presented in collaboration with Ramapo Green and Ramapo 1-Step. Learn innovative ways of reducing your waste stream by reusing things that you thought were trash. Ramapo College of New Jersey is the state’s premier public liberal arts college and is committed to academic excellence through interdisciplinary and experiential learning, and international and intercultural understanding. The College is ranked #1 among New Jersey public institutions by College Choice, and is recognized as a top college by U.S. News & World Report, Kiplinger’s, Princeton Review and Money magazine, among others. Ramapo College is also distinguished as a Career Development College of Distinction by CollegesofDistinction.com, boasts the best campus housing in New Jersey on Niche.com, and is designated a “Military Friendly College” in Victoria Media’s Guide to Military Friendly Schools. Established in 1969, Ramapo College offers bachelor’s degrees in the arts, business, humanities, social sciences and the sciences, as well as in professional studies, which include business, education, nursing and social work. In addition, the College offers courses leading to teacher certification at the elementary and secondary levels, and offers graduate programs leading to master’s degrees in Accounting, Business Administration, Educational Technology, Educational Leadership, Nursing, Social Work and Special Education.